"Love this artful concept. Good investigation of traditional, creative barriers for security with strong metaphors about each interpretation. It's innovative and cleverly presented." 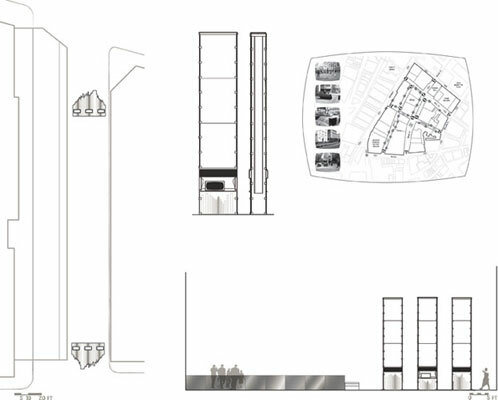 (In)Security explores a new design vocabulary in direct response to the climate of fear and paranoia that currently drives the program and aesthetic of much contemporary urban design. 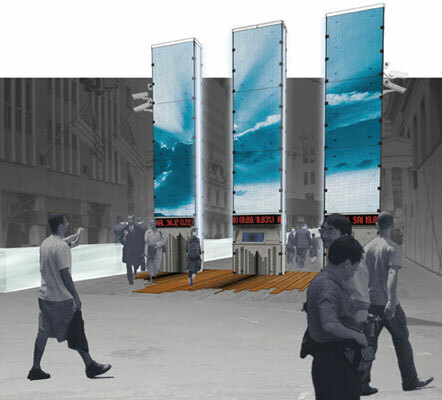 The project addresses the current and future state of security in and around the Wall Street financial district, creating viable security alternatives while simultaneously questioning our nation’s current philosophy that security = freedom. Following September 11, 2001, New York City and the nation began to contemplate the ideas of freedom and security more than they had since WWII. Preventative actions were taken to assess potential targets of further terrorist activity, and set up appropriate security measures accordingly. Being a short distance from ground zero, the Wall Street financial district was seen as a highly probable target and so precautionary measures were taken to ensure its well-being. 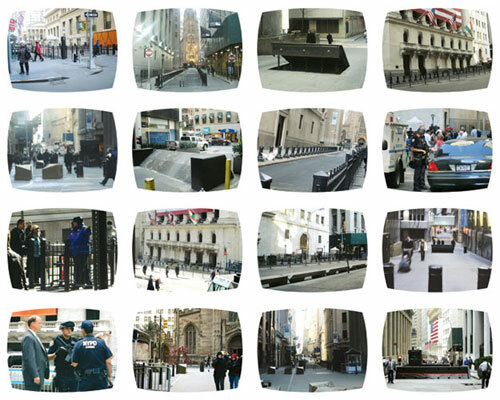 Thirteen security checkpoints, encompassing eight city blocks, were constructed throughout the district, regulating and prohibiting both vehicular and pedestrian access to streets surrounding the New York Stock Exchange. (Fig. 393_01) A restricted perimeter was erected around the NYSE building itself, allowing only personnel and employees within its confines. 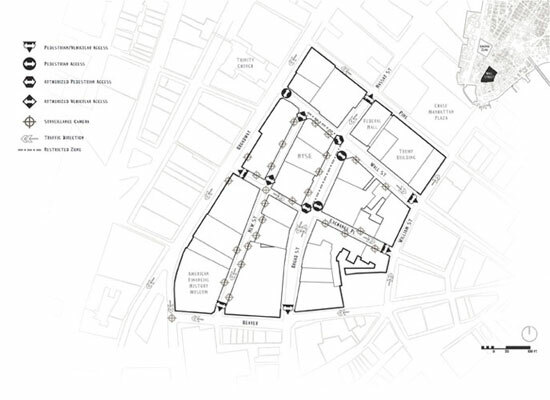 The length of Broad Street running between Wall Street and Exchange Place was effectively cleaved in half, divided by this perimeter, to ensure no suspicious vehicle or person ever get too close to the Stock Exchange. Private security officers were stationed within the perimeter, while outside, vehicular access was prohibited leaving this length of Broad Street for pedestrian use only. Along with these barricades, surveillance cameras, jersey barriers, metal bollards, concrete planters, and other “cosmetic” security devices were utilized in order to enhance and strengthen ground-level security of the buildings. (Fig. 393_02) Armed police officers and bomb-sniffing dogs patrol the streets, greeting many vehicles entering the site. Hordes of private security officers roam the area and secure each entrance to buildings throughout the district. You are told what is permissible to photograph, despite the fact that everything is under surveillance. The general atmosphere is one of military occupation. This simple network of barriers and checkpoints has transformed the financial district into a gated community, a medieval walled city where all movement into and throughout the site is regulated, restricted, and scrutinized. On 9/11 the lives of New Yorkers were interrupted in the most horrific way, but these security measures are an interruption of another nature. Serving not just as physical barriers, they also act as visual deterrents; teeth baring by the Powers-That-Be to remind us that, along with the would-be terrorists (whoever they may be), we are all under suspicion. However, on a conscious level, people don’t seem to be aware of these gestures. Judging by the general comfort level and lack of alarm on the part of New Yorkers, one might surmise that most people even welcome them, or at the very least, are apathetic to their presence. How did such an obtrusive action come to be so casually accepted? In the name of safety, Americans are willing to surrender a very small portion of those civil liberties that are the very embodiment of our sense of freedom. The current state of paranoia and fear within the U.S. begs the question: how much of our civil liberties can be chipped away before we begin to notice? How much of our own freedom are we willing to give up in order to feel secure; in order to feel more free? Currently plans are in the works to renovate and reinvigorate the area. Design firms are being commissioned to rethink the current fascist aesthetic of the district and deliver more “attractive”, less threatening security devices. The ideas being presented seek to conceal, and, sometimes quite literally, hide the security devices underground. The goal is to beautify or camouflage them; in essence, making them invisible. 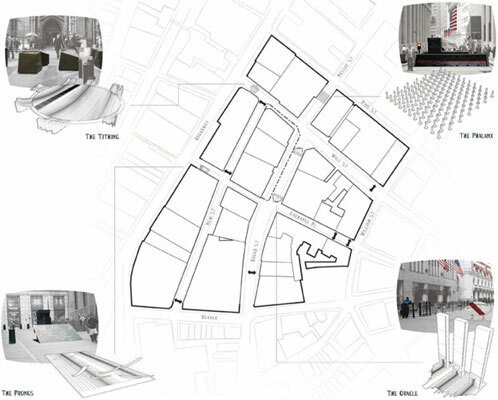 On the surface this re-envisioning of the district seems like an honorable endeavor, however, it is quite simply a method for increasing the strength and influence of security in the public realm while guaranteeing the public’s ignorance of it. Do we, as citizens of the United States and the world, want to be fully cognizant of our fears, the origins of those fears, the products of those fears; or do we simply want the luxury of assuaging them cleanly and sterilely by relinquishing our awareness and freedom in the name of security? (In)Security questions the ideas of freedom, security, fear and complacency within the United States, and challenges our nation’s current philosophy that security = freedom. 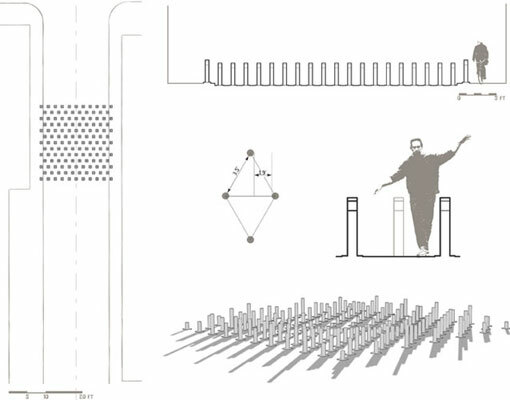 The project’s aim is to invent a new barricade vocabulary that can be applied to each of the existing security checkpoints, creating viable security alternatives while simultaneously maintaining their visibility, and prodding people to ask themselves just how much of their personal freedom they are willing to relinquish in order to assuage their fears. Four security barricades were conceived. By creating thresholds into and throughout the district, (In)Security sets the tone for the experiences within this walled city. (Fig. 393_04) During the design process, archaic and contemporary methods of fortification were researched. Forms were explored as a result of the hybridization of the two. (Fig. 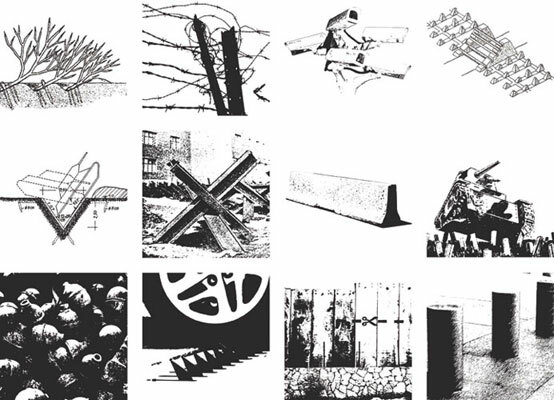 393_03) Each barricade is an investigation of both fortification and subversion; designing for the defense of each checkpoint, while simultaneously attempting to undermine it’s perceived raison d'être through a means of confrontation, provocation, or absurdism. 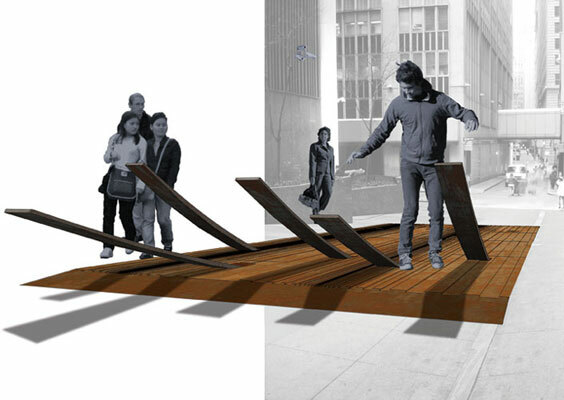 A set of five, staggered, steel prongs reaches upward out of a ridged cor-ten plate, meeting pedestrians at face level. The tectonic hybrid of tire spikes and medieval Abbatis castle fortifications, (Fig. 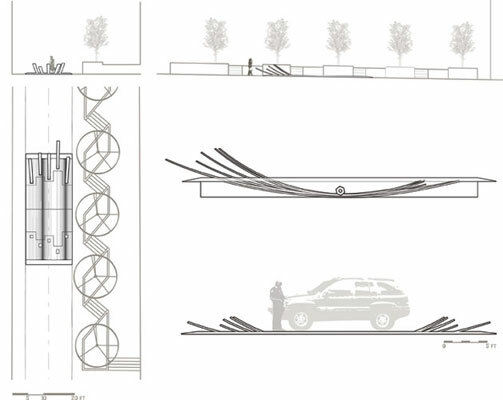 393_03) their precise arcs allow for only shallow intrusion into existing street infrastructure. As a vehicle approaches, the prongs retract. A slow, mechanical clanking of a single gear alerts those nearby that the gate is opening. The prongs in turn emerge from the opposite side acting as a lock system, restraining the vehicle for inspection. After the vehicle is cleared for entry, the prongs then retract in the opposite direction allowing, the vehicle access, and resetting themselves to their initial positioning. 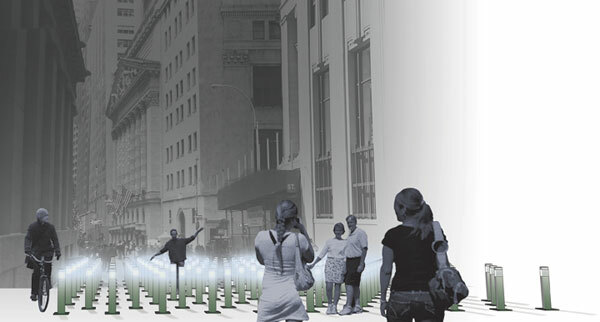 The retractable bollard, increasingly common to most large cities becomes a thing of spectacle when multiplied and configured in a field formation. Their combined strength ensures that no vehicle will gain entry. Bollard spacing allows for only slow, methodical movement in order to navigate the threshold. The Phalanx can be reconfigured into a variety of formations. When a vehicle approaches, the bollards, in whatever configuration they reside, recede into the ground. Upon the vehicle’s entry, the bollards emerge in a new pattern. The Phalanx configuration could be randomly generated, or based on a more sculptural or whimsical pattern. By maintaining a non-repeating formation, encounters with the Phalanx will not so easily become monotonous and forgetful. 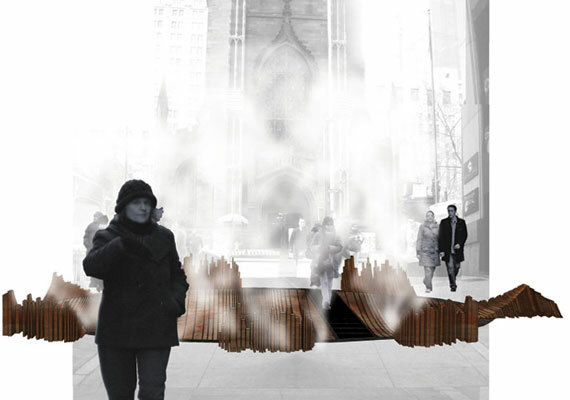 A shallow, cor-ten steel bowl sits at the foot of Trinity Church, guarding the entrance into Wall Street. 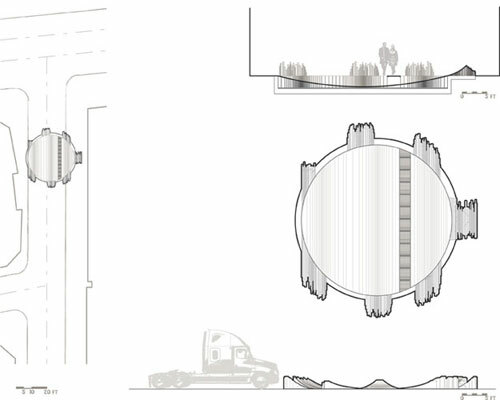 The series of rigid, toothy plates and its concave geometry work in tandem, prohibiting vehicular traffic from entering the site. Steam emits from narrow openings in the base. A wall of fog obstructs views in and out of the site, enveloping the forms of all who enter. Crossing the threshold of this ethereal, vaporous moat does not come without a price. Upon entering into the heavily monitored, highly secured district, you are relinquishing something of yourself. You are sacrificing your anonymity. Two oracles flank the pedestrian mall that runs along the NYSE. Their towering forms are a contradiction of solidity and light, made solely possible by translucent concrete. Upon investigation, the peculiar experiences of traversing this district become evident. As the informational hub of this network, the Oracles record, compile, catalogue, and broadcast information gathered from throughout the site. On the kiosk monitor, data from the surrounding security barricades is displayed, e.g. the amount of traffic entering and exiting the site, license plate numbers, driver and pedestrian photos, etc. Video is on a time-lapse feed, coordinated so that people have ample time to navigate to the center of the site and witness themselves captured on camera. This is not a narcissistic, techno-savvy experience. The Oracle gives access to information, but is not interactive. Spectators are merely witness to the countless ways in which their movement and identity is catalogued. They have no control over the flow of this information, reminding them that while they are within the confines of this walled city, they are under someone else’s control. And projected from the translucent, concrete wall of the Oracle is a seemingly simple, lighthearted image; that of a vivid sky, laced with clouds. What does this have to do with the network of ground security that protects this valued piece of the city? Keep asking yourself.